Ask anyone to name a square on the Monopoly board and there’s a pretty good chance they’ll name the Old Kent Road, the very first square on the board and the one which yields the least amount of money when an opponent lands on it. It’s also the only property that lies south of the river Thames. In fact, it not only lies south of the river but in comparison to how the other properties are all clustered around the square mile, it lies a long bloody way south of the river! To make matters even worse, checking out the Cask Marque website it would seem that the nearest Cask Marque pub is the Kentish Drovers which is even further away, another kilometre or so south on Peckham High Street. As any regular visitor to London knows the south isn’t served very well by the Underground with only a couple of the lines venturing under the river. 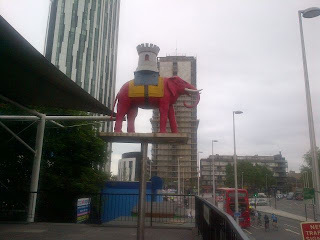 The nearest station to the Old Kent Road is the Elephant and Castle and it was one Tuesday evening that I found myself wandering the labyrinth of the subway that weaves its merry way underneath the Elephant and Castle roundabout. Seriously, no matter how good your sense of direction you seem to pop up nowhere near where you were heading! Pink Elephants but no Delirium Tremens. Upon venturing above ground the first sight that greeted me seemed very familiar but was one I couldn’t out my finger from where I knew it. 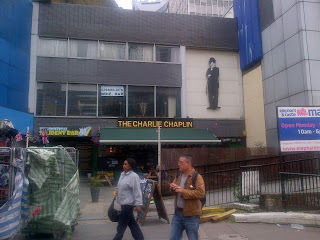 The sign said “The Charlie Chaplin” but it was almost as if I was seeing a photograph in real life, ah well perhaps it would come to me later on. In order to get my bearings I checked the Cask Marque app and discovered that whilst the Kentish Drovers was near to the south end of the Old Kent Road, just off the Elephant and Castle roundabout was another pub, the Rockingham Arms which is about the same distance away from the Old Kent Road as the Kentish Drovers but this time from the north end. Deciding that this would be by far the more sensible of the two to visit I made a quick dash down the New Kent Road to the very start of the Old Kent Road, took a photo to prove I’d been there and then dashed back again to the Rockingham Arms. 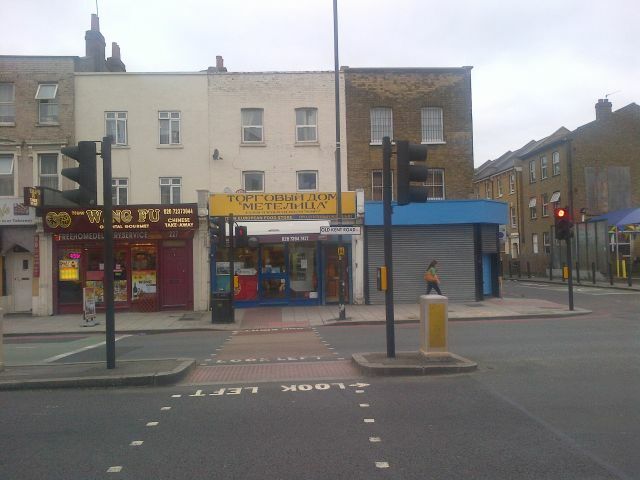 If you look very closely the sign does say "Old Kent Road".....honest! The Rockingham Arms is part of the Weatherspoon’s chain and whilst I have much respect for the great work they have done (good ranges of cask ales, fantastic value and keeping many a run down corner of the high street trading) they can also be awfully identical, impersonal and pretty bland. 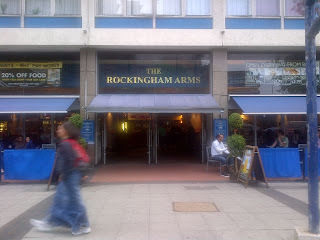 The Rockingham Arms was always going to have its work cut out anyway. Housed in what I’ve learnt from the Weatherspoon’s site was the former HQ for the Department of Heath and Social Security it looks like something that been transposed from 1970’s East Germany. This has to be one of the ugliest buildings ever. The large plate glass frontage has all the style and welcome of a carpet salesroom and the interior décor (which looks like a cross between a run down cinema and a run down amusement arcade) does nothing to improve this. That said, it was clean and far from overcrowded although there was the perennial Wetherspoon’s clientele that seem to always be there no matter what Wetherspoon’s you visit. The range of beers was pretty basic with only Greene King Abbot Ale, Ruddles Best and London Pride on draught, and when you see London Pride being described as a Guest Beer (in London no less!) you do have question whether this pub needs to ask their supplier a question or two. Service though was lightening fast, I reckon my meal came within 10 minutes and the pint of Ruddles Best was actually very nice, and a £1.85 a pint can you really complain? 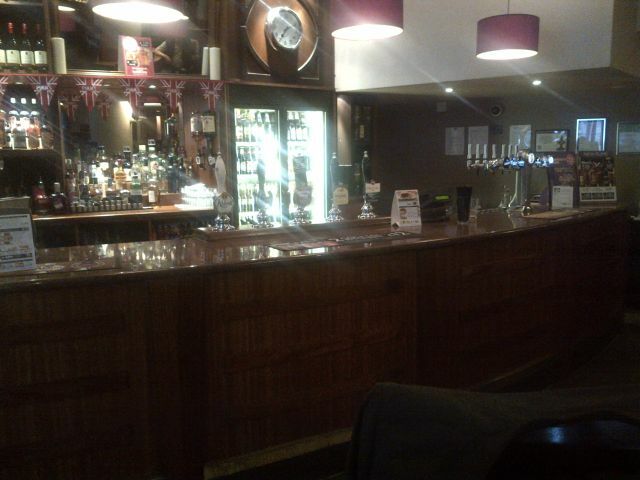 Bar at the Rockingham Arms, Cask Marque certificate on the right. 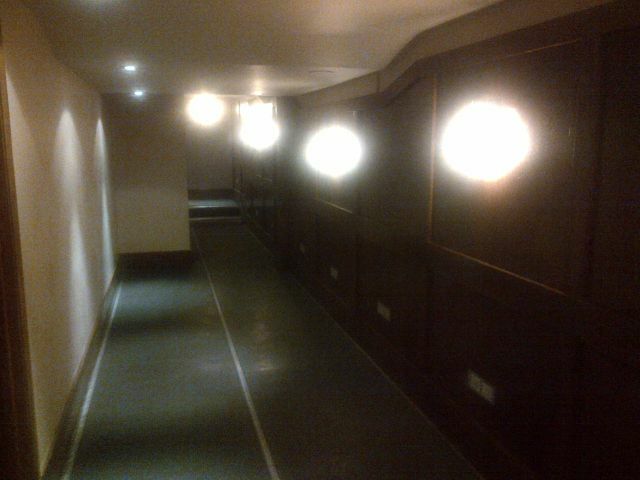 Final word on the pub was a visit to the gents which felt like wandering the corridors of a cruise ship before you could do your business…………perhaps the former employees of the DHSS were only allowed limited comfort breaks? 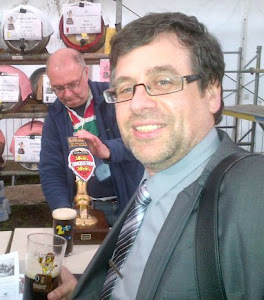 With the proudly displayed Cask Marque certificate snapped I was on my way again, via the slow train from Waterloo to Reading which seems to stop at every village and hamlet on the way. If you’re ever on this train, check out the recorded announcer’s voice when he calls the station names. He obviously hates the journey to the next place, but loves arriving. “The next station will be Ascot” and the voice is all sad and depressed, whereas “This is Virginia Water” is yelled with a high rising inflection that would make an Aussie blush. Ah well, kept me awake……..just, and then I realised where I’d seen Chaplin’s Bar before! Page 72 of The Rough Pub Guide by Paul Moody and Robin Turner, which says it should have been pulled down in 2010. Perhaps the demolition crew are lost in the subway? Next Stop = Community Chest?